Welcome to another ESAD Blog Hop! Tonight's Hop is featuring 28 amazing, talented Australian & New Zealander crafters who each have selected some of their favourite retiring products to showcase. Although the end of a Stampin' Up! catalogue can be a sad time (we have grown to love the products!) of course there is still time to get these awesome items before they go for good on May 31st. Definately check out my online store for the Last Chance items! Items available until stocks last or strictly May 31st. I have used the cute images from retiring soon 'Message in a bottle' which features these cute bottle & whale images. My son Marco is obsessed with Whales, if he could carry one around in a bottle in his pocket he would be n cloud 9! I also used a retiring emboss folder (Polka Dot Basics) & retiring DSP (Colour Theory) to decorate the front. If you like my colour combination, please share it on your favourite Pinterest board! Thanks so much for stopping by. I hope you enjoyed seeing my project please take a few moments to leave me a comment I'd love to hear what you think. Please continue on the Hop by clicking on the next button, if you get lost along the way there is also a full list below. Next up we have Renee Lynch. 19. Carolina Evans - That's me!!!! 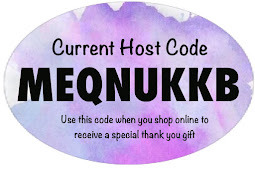 Remember use HOST code HJF29CNF to receive a special thank you gift! Shop here. what a great card. LOVE your creativity. 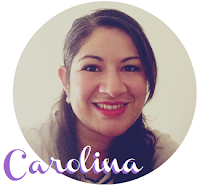 Super cute card, Carolina. Love your colour combination. Super cute card Carolina, I love these colours together. What a great card Carolina ... love how you did your background layer! Cuteness overload Carolina! I love how you assembled the DSP's!